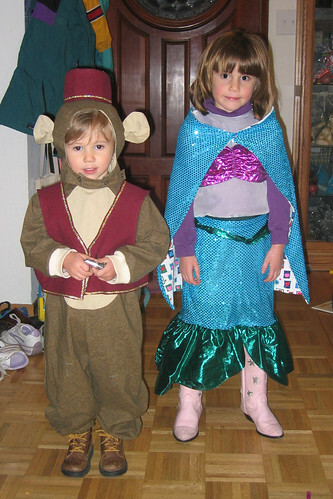 A very, very cute monkey costume for toddlers. The basic pattern is a back closing jumpsuit, with a headpiece and shoes. Other views are a butterfly, lion, and frog. Pattern at Patternreview.com. Supposedly 1/2 (6 months) to 4T. Note that my son is only 37 inches tall, which is the height for 3T, and the 4T fits him just fine. So, again, I strongly recommend that you measure the flat pattern before starting. I was hoping that this costume would last more than one year, but I don’t think it will. The headpiece come in 3 sizes with no sizing information given. I made the largest, and it was too small. I added an extra piece to make the chin strap longer. 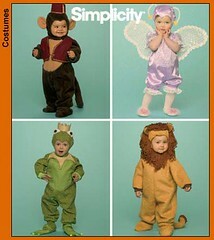 Yes, but Simplicity “simplifies” costume pattern instructions which I really don’t like. I don’t think it makes the costume easier to sew. There were no instructions on sizing for the headpiece, and there were no instructions on attaching the hat to the headpiece. DISLIKE: The sizing & instruction issues discussed above. The pattern calls for fleece, and this year that might have worked, but since we can’t count on it being below 100F/38C before November, I choose to make the costume out of quilting cotton/broadcloth. The butterfly costume calls for a woven cotton, and since it uses the same pattern pieces, I figured the cotton would be fine for the monkey, too. Instead of velcro, I used snaps for the jumpsuit and for the headpiece. I had to add the chinstrap in which I would insert elastic if I were doing it again. I topstitched a lot of things because I think that makes a big difference. I sandwiched the elastic in the headpiece between the 2 layers instead of just sewing it to the lining. I tacked the hat down at the seamlines on the headpiece. I used timtex instead of a heavyweight fusible interfacing in the hat. I made monk’s cord and only used one button on the vest, and I embellished the hat instead of using a tassle. I probably won’t sew it again. How many monkey costumes does a little boy need? And my kids will be too big for toddler costumes next year. It’s really cute, so I think it is worth the effort and aggravation. Just be careful about the sizing.